Hunting for new genetics in old trees. There’s a long history of treasure hunting in the hills and mountains of Montana. Gold, silver, copper, and sapphires brought immense riches to a lucky few in the early days of the state. 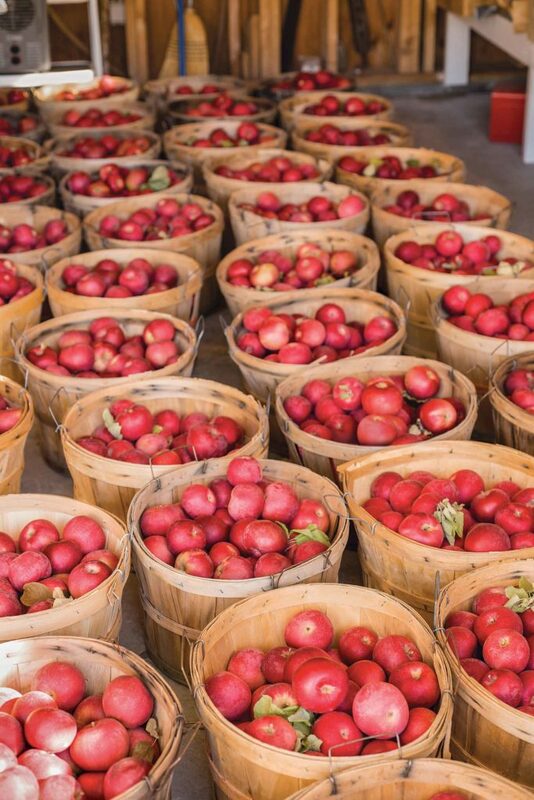 Now Toby Day, Montana State University Extension horticulturist, and a group of like-minded scientists are seeking their own version of treasure — genetics from long-lost apples. Apples those treasure seekers of old, and certainly the homesteaders that followed, may very well have enjoyed. Since 2014, the team has been scouring forgotten and dilapidated orchards throughout the state in search of century-old apple cultivars that have stood the test of time and neglect, proving their genetic merit. From this hardy survivor stock, the Heritage Orchard Program has released two “new” heritage apple trees and continues the hunt. The first found cultivars released were Chief Plenty Coup ‘Duchess’ and Chief Plenty Coup ‘Wealthy.’ Both pulled from five stubborn trees, they were all that remained of a once grand orchard planted by Chief Plenty Coup at the turn of the century. While plentiful flavor is a factor in the hunt for heritage apple cultivars, a big driver is finding survivors and saving the genetics that sustained them. Apple tradition. While most of the trees in John Ross’ Fromberg, Montana, orchard are relatively modern, his own roots in Montana’s apple industry run deep. Now retired from practicing law, he spends his spare time tending his apple trees in the Clark’s Fork Valley, an old family tradition. The propaganda was grand. Newspapers of the day reported apples, pears, peaches, and any other fruit short of those from the tropics would flourish in the region. While the fruit produced was fantastic, using the word “flourish” may have been a reach. Ross chuckles there aren’t many pear or peach trees around, but several apple varieties have been quite successful. As he picks his laden trees he tells of how his father used to pick apples as a teenager. He would then walk through the train cars selling them to passengers when the train stopped in Fromberg. Ross himself spent many happy days visiting orchards throughout the valley to pick apples with his father. It’s these traditions that led to him to purchase his own orchard adjacent to his father’s and his interest in the Heritage Orchard Program. Thanks to his grandfather’s promotion of the Clark’s Fork Valley as a fruit growing Eden, Day has had a treasure trove of old orchards to harvest DNA from in the valley. Ross worked with Day to take samples from trees in the orchard his father planted in the 1950s, but it’s likely his family is linked to many of the much older trees Day has sampled in the area, too. Including those just a few miles down the river in Chief Plenty Coup’s orchard. “My grandfather and Chief Plenty Coup were friends, and I can’t help but imagine that they talked apples and that he may have influenced him, in part, to plant his orchard,” Ross says. The very same orchard yielded the first two cultivars of the Heritage Orchard Program. Hunting grounds. The hunt for heritage apples has taken Day and his partners in the Heritage Orchard Program to many remote locations. Along with apple trees, they’ve discovered rich history and had grand adventures worthy of explorers. Wild Horse Island, the largest island on Flathead Lake in northwestern Montana, is home to both horses and well-aged orchards. A boat ride and a 1-mile hike brought them to an old orchard where just 11 trees remained. Due to the travel, Day and his team were without ladders, trying in vain to knock apples out of the trees with rocks and sticks. “One of the horses [no longer wild nor native to the island] came over, grabbed the tree branch, and gave it a shake. Several apples came down. He showed us how it was done!” Day laughs. Just north of the same lake lies another abandoned orchard. Sunny Slope orchard was 1,000 acres when it was planted. Day surmises it was planted by the railroad to show settlers the rich land and entice them to the area. Once population was established, the railroad would then build to them. “The railroad would plant orchards as a symbol of good fertile lands when they wanted to expand into an area. If they could get people there, they could build,” Day says. They think the orchard’s location may be why the railroad town of Kalispell is booming and the town supported by lake barge traffic further to the south, Merriam, is now extinct. Within the once-sprawling acreage covered by row after row of apple trees, Day found a number of surviving trees. The history was a bit spotty, so he didn’t know when the trees were planted. The Ponderosa pines growing in the orchard provided a helpful clue. Unlike the apple trees, the pines could be cored. They were determined to be 95 years old. The pines wouldn’t have been growing when the orchard was in use, so the trees were likely planted around 1870, making the orchard even older. These 100-plus-year-old surviving apple trees are precisely the sort Day hopes will yield the next generation of hardy Montana trees producing tasty apples. 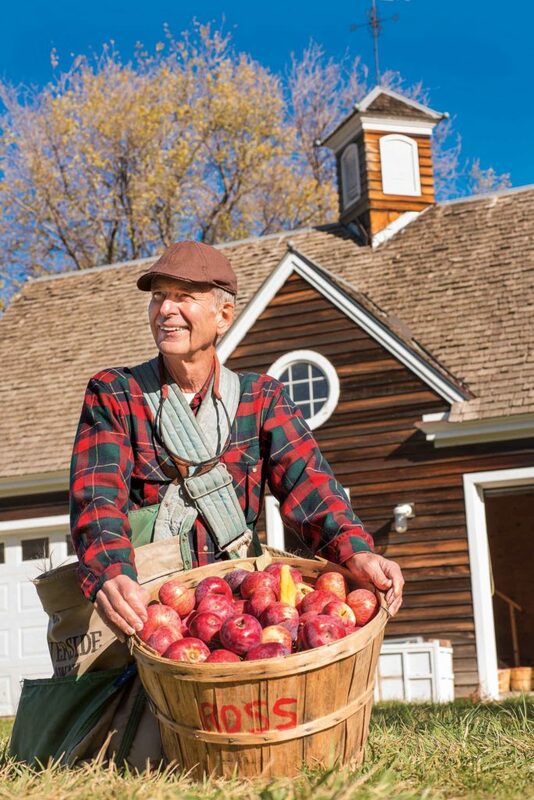 John Ross grows diverse modern cultivars and is helping in the search for heritage cultivars continuing his family’s long legacy of promoting apple production in the Clark’s Fork Valley. Just being old doesn’t automatically make them a winner. The taste has to be right, too. Picking winners. The researchers lean on the orchard owners when possible to help them identify the trees that produce the best apples. Apples have many uses, so taste isn’t the only identifier. With the rise in popularity of hard apple cider recently, potential cider cultivars certainly make the cut. Once trees are identified, Day will return to the orchards in February or March to harvest new growth branches from the trees. The branches are put in water which forces them to bud and push out the first leaf, which is collected for DNA sampling. “An apple is the result of two parents, so you have to sample the tree. The new leaf is the cleanest DNA you can get,” Day explains. They take the DNA and compare it to a database of DNA collected from cultivars known to be grown in Montana. If the DNA doesn’t match up with any known cultivars, the data is sent off to a national lab for geneticists to cross check with their database. “If we find something new we will go back to the tree that summer to collect branches we’ll use to do bud grafting in the fall,” Day says. Each branch produces several buds which can be grafted onto modern root stock. The branch fuses with the root stock and the first thing that grows the next spring is the bud from the new cultivar. Once the graft takes, the trees are dug and sold to nurseries for further propagation. But it’s not about money. It’s about finding trees that are proven survivors so more generations can share the joy of growing fruit no matter the region. Weeds are Patterson Clark’s palette...and his canvas.